We're headed to Salt Lake City, Utah for the 2018 Transplant Games, set for Aug 2-7. This will be my 8th year participating... every other year since 2004. A great experience competing with fellow transplant recipients and sharing stories of how fate brought us together. The fact that we are so blessed to still be alive because someone less fortunate foresaw the possibility to donate his organs in the event he was taken from us prematurely. 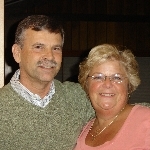 Scotty Bates of Trenton, Michigan left us suddenly, but not without helping over 50 recipients. He gave me his heart, and 17 extra years I never would've had otherwise. He had a big heart... just ask anyone who knew him (that's his mom pictured above, who he loved dearly). I can tell you without a doubt, it beats as strong as ever. It gave me the opportunity to attend these games and compete against other organ recipients in olympic style events such as the 5K Road Race, the 1500m race walk, the softball throw, etc. I've been lucky enough to win several medals along the way and that's cool but I owe all that to my donor and his family - pure gold! Want to join me in supporting this great cause? Your contribution will make an impact, whether you donate $5 or $500. Every little bit helps. Thank you for your support. I've included information about Transplant Games of America below.